Stand out on the show floor with a fresh, contemporary backlit VersaWall System trade show exhibit featuring continuous graphic imagery unbroken by exposed extrusions. Offer visitors an experience that immerses them in your brand. With skyscraper towers or majestic vistas, our flat and curved graphic walls express your message in a bold new way. Our slim profile extrusion accepts both SEG dye sub fabric and rigid infill graphic panels. 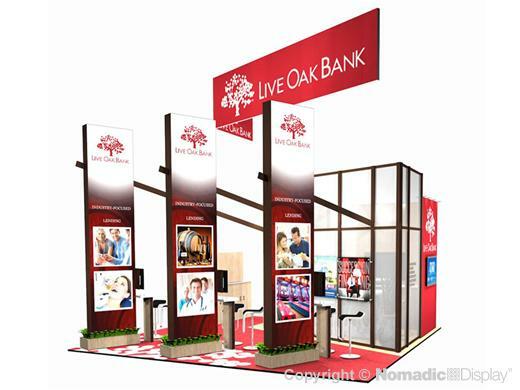 This trade show booth design features a private conference room, walkin storage, media work Stations, presentation area, laminated extrusion, backlighting that will make your graphics pop, AV for looping presentaions, and lockable storage. Contemporary in style yet practical, our trade show exhibit design blends custom features with lighter weight materials to lower your storage, transportation and drayage costs.